At South West Water’s recent Pure Award ceremony Partech were delighted to have been short listed in the Pure Service category with the judging panel recognising the ‘culture of enthusiastic customer service’ that we promote within the company. 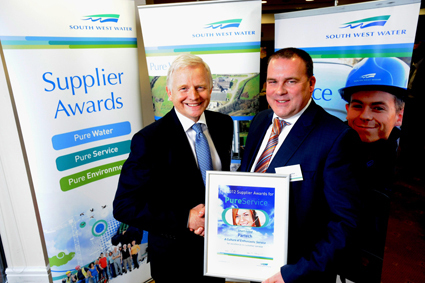 The Pure Awards contribute to South West Water’s vision of delivering Pure Water, Pure Service, Pure Environment and Pure Innovation, and are presented in these four categories. They are open to all South West Water employees and partner organisations who deliver services out in the field. Winners are chosen by a panel comprising South West Water directors and a senior representative from the Consumer Council for Water. Partech are a framework supplier of instrumentation to South West Water, providing vital measurement data on the performance sewage treatment plants across Devon and Cornwall. These products are supported by our committed team of after sales and service engineers led by Martin Hughes. Following the awards ceremony Martin commented, “maintaining instruments long after they have been installed ensures that our customer’s receive the best possible value for their investment, it is great to have our endeavours recognised”. “Onsite support of our products is an ever increasing part of our business”, says Angus Fosten Sales Director, “our customer’s are focusing on their key functions, we are offering expertise in measurement and control to supplement their in-house resources”. Based in St Austell, Partech supply water quality instrumentation products across the world and will shortly be taking part in an EU funded mission to South Korea and have recently had products specified by the United Nations for use monitoring water quality in all their humanitarian missions.